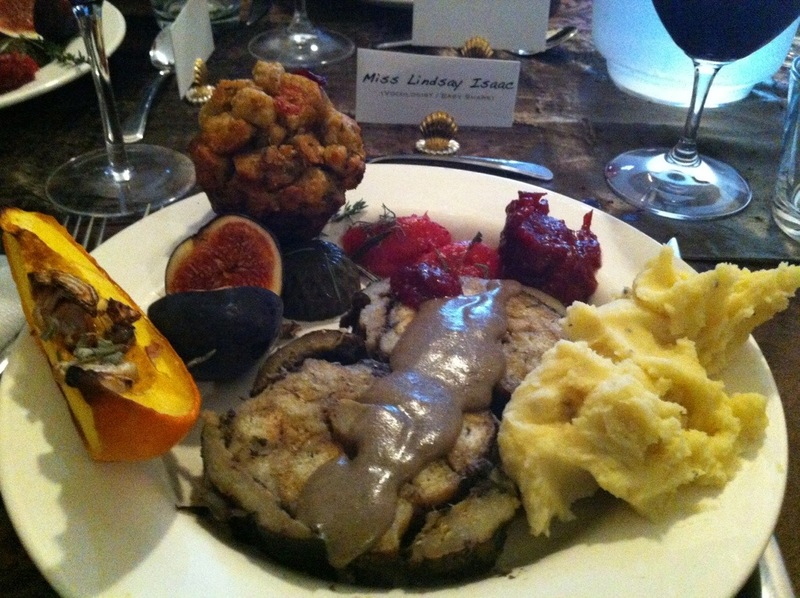 I’m still savouring the wonderful Thanksgiving dinner we had Sunday evening. The food, the company, it was all just perfect. I proclaimed this morning that we should celebrate American Thanksgiving as well, just so we can do it again next month. 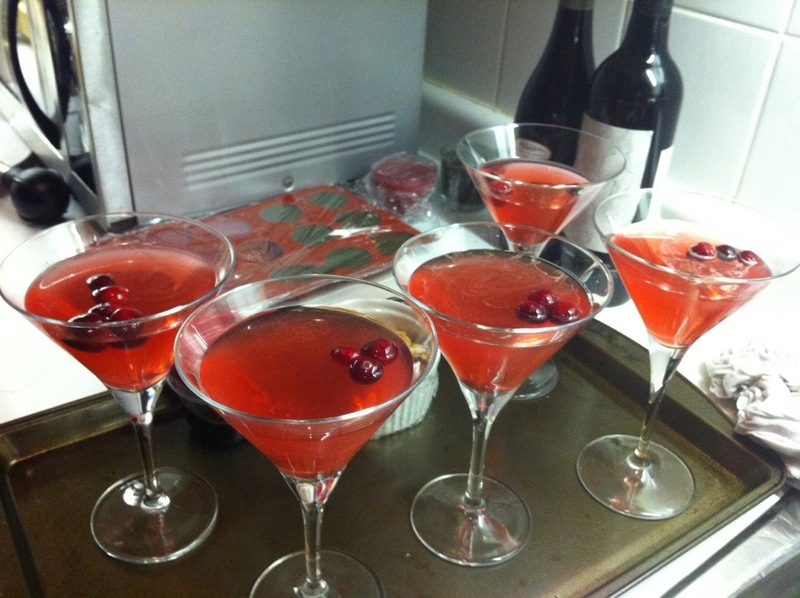 And as soon as we arrived, we were greeted with crantinis (and cranberry sodas). There was so much wonderful food for us veggies: stuffed eggplant, Stuffin’ Muffins (TM according to Michael, and made gluten-free for me! ), potato mash with caramelised onions, molecular-gastronomy inspired vegan agar jellies bursting with rosemary and onion flavour, cranberry sauce, and my all time favourite fruit — a fig! That wedge of squash you see there? That’s what we brought. Along with the pumpkin pie, I was charged with bringing the squash dish. I love all things squash, and so I got to finally make a squash dish that has been rattling around in my head for a while. 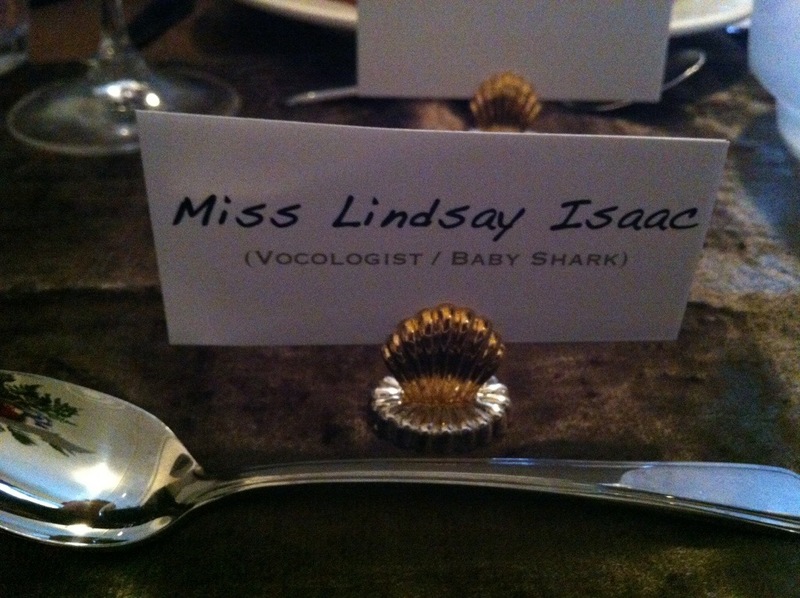 This one is definitely going to make it onto the dinner party rotation. 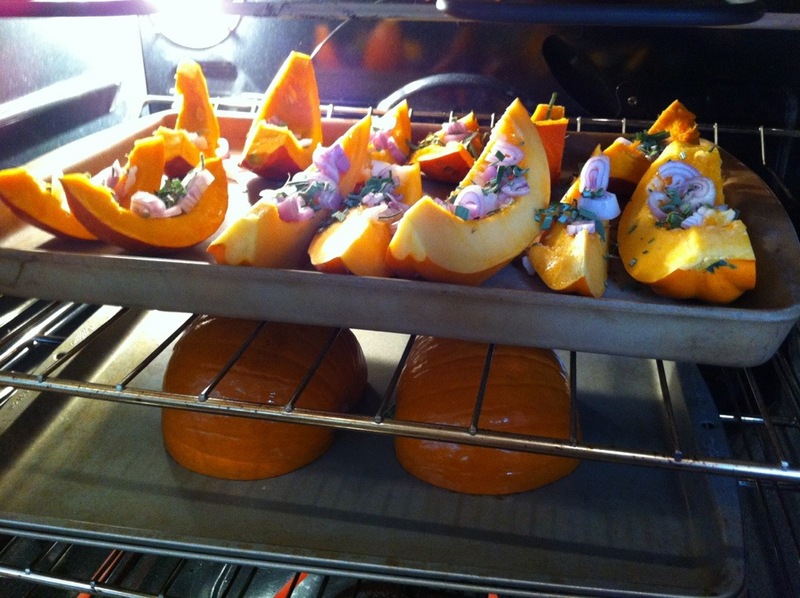 I love roasting squash, and I thought that roasted squash with my favourite Thanksgivingy herbs (sage, rosemary, and thyme — cue Simon & Garfunkel) would be just divine. So I cut up some shallots, and tossed them on with the herbs. Oh so wonderful. 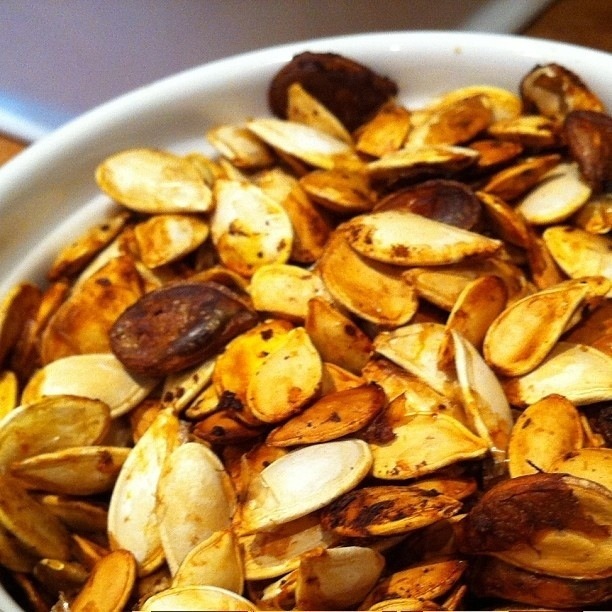 And because they are just so good, and holidays are all about nostalgia, I also toasted up the squash’s seeds (with some sumac, cayenne, and sea salt) and sprinkled them on top. And because I could, I added a drizzle of pomegranate molasses. We all ended up dipping everything else our plates in the pomegranate molasses left on the serving dish — so I’m calling it a mandatory ingredient. I found mine in a bottle at our local grocery store in the “ethnic section”… I’ve also seen it at health food stores and Middle Eastern food shops. I hope you love this squash as much as we did. Mmmmmm. Cut the squash in half and scoop out the seeds. Set the seeds aside. Cut the squash into wedges, and place flesh-side-up on a baking sheet. 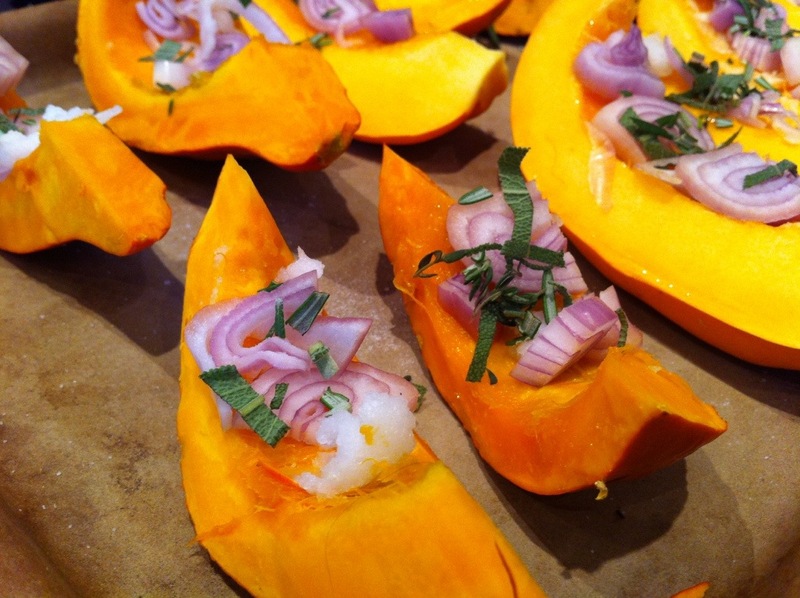 Top each squash wedge with coconut oil, shallots, sage, rosemary, thyme, salt and pepper. Roast the squash at 425F for 35-40 minutes, until the flesh is completely soft and you begin to get some caramelisation around the edges of the squash. 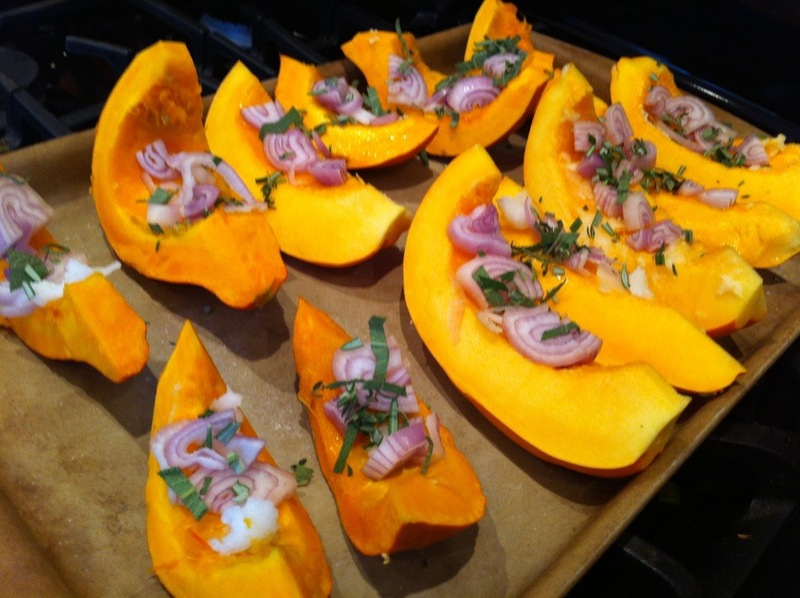 While the squash is baking, spread out the squash’s seeds on a separate baking sheet. Sprinkle with cayenne, sumac, and sea salt. Toast at 425F for 25-30 minutes, or until the seeds are crisp and crunchy — be careful not to let them burn (they go quickly!). 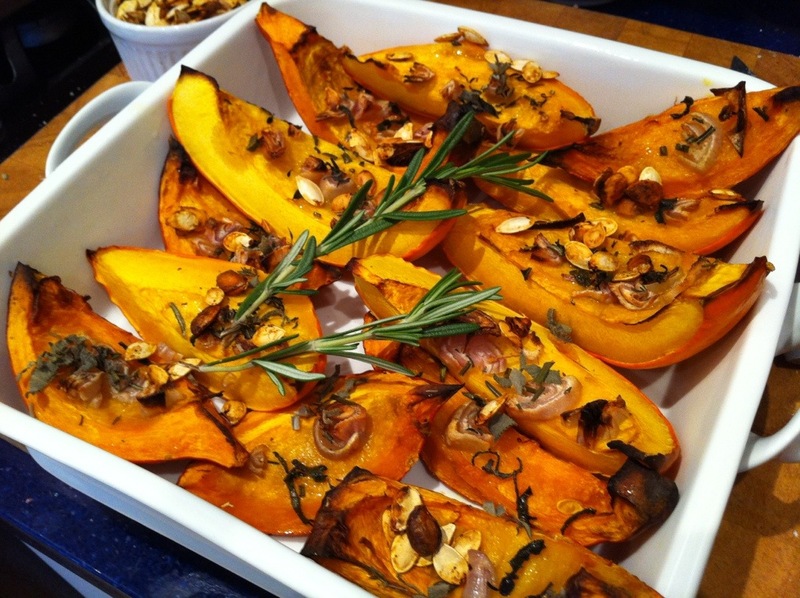 Once the squash has roasted, remove it from the oven and plate it on your serving dish. Sprinkle with the toasted squash seeds. Serve warm or at room temperature. Just before serving, drizzle the pomegranate molasses over top. Enjoy!! I love sumac and would have never thought to put it on squash seeds. I will do this when I roast my seeds! It looks like you had a nice Thanksgiving! This was my first time using sumac on seeds too, but it was delicious!!! I’ve never used pomegranate molasses, but I may have to get some so I can try this recipe. It looks amazing! Can’t wait to try this! What a beautiful plate full of food! I’d love to try the roasted squash. I’ve been meaning to look for pomegranate molasses, but it’s good to know I can make it myself as well – thanks for linking to a recipe!